No garden should be without strawberries. They are beautiful, very easy to grow and normally the first fruits to appear in spring. Strawberries can grow in a variety of climates; you can find plants adapted to your region from a local nursery, or neighbour who is already growing them. The plants are easily transferable and begin to thrive quickly after being re-planted, provided a few conditions are met. Strawberries need a site with excellent drainage, as to not drown the roots, so a gentle slope or raised bed would be ideal. 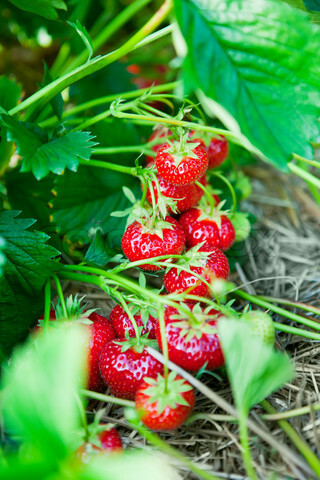 Plant your strawberries in spring, as soon as the soil is dry enough to work with. The can freeze easily, so it is important to pick an area that gets full sunlight, this will insure late frosts do not damage your fruits. The soil should be slightly acidic - from 6.5 to 5.5, and be high in organic matter so add compost, well-rotted straw or manure to the bed before planting. For each plant, dig a hole 5 to 7 inches wide and deep enough to just cover the roots. Set plants about 8 - 12 inches apart in matted rows; they will spread and send out runners that will quickly spread. Once your garden has reached a desired size, to strengthen your plants cut off any runners as soon as they appear, this will allow more energy to be directed into fruit production, which can go on giving ample harvests for six or more years. Harvest your strawberries the day they ripen, as they are prone to spoil easily or fall off the vine.